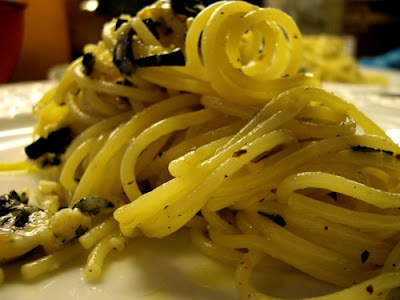 This recipe inspired by the famous English-Italian cook Antonio Carluccio as he visited Italy in one of his food program in quest for the white truffle. He prepared what he called the most expensive pasta dish in the world for the truffle hunter and his wife as they returned home from the lush forests. They were peasants that never had tasted truffles in spite of the fact that they are found just outside their doorstep. Antonio Carluccio boiled some plain tagliatelle, and then prepared the sauce. Butter and garlic heated in a skillet, a little salt and pepper and a €750 white truffle. Some of it slightly warmed in the skillet and the rest mixed raw into pasta in thin slices. And to end it - some parmeggiano reggiano. And then she tasted truffles for the first time in her life. Yesterday I opened up a glass of black truffles and prepared them according to Antonio Carluccio, using Kviteseidsmør, an aromatic butter originating from Kviteseid in Telemark County. I chopped the two black truffles and heated them in butter adding 1 tsp minced garlic. Then I poured the butter over boiled linguine and mixed it with grated parmeggiano.